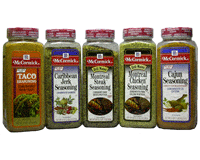 Montreal Chicken® Seasoning is inspired by succulent food served at Canadian outdoor cafes on sunny afternoons, McCormick Montreal Chicken Seasoning combines the soft richness of onion and garlic with piquant black pepper and citrus, sweet bell peppers, paprika, and other ingredients. This north of the border seasoning blend is equally at home on poultry, seafood, vegetables, and pasta. 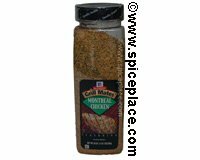 Sprinkle Montreal Chicken Seasoning on, use Montreal Chicken Seasoning to make a marinade or add Montreal Chicken Seasoning to soups and sauces and you'll awaken the tastes of old favorites. Ingredients: Garlic, Salt, Onion Spices (Including Black Pepper, Parsley and Red Pepper), Orange Peel, Paprika, Green Bell Pepper and Sulfiting Agents. 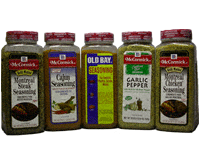 Mix 1 tbsp McCormick Montreal Chicken Seasoning, 1/4 cup olive oil, 2 tbsp white wine vinegar and 1/2 tsp Italian Seasoning in a cup. Place 1 pound of chicken in gallon size reclosable bag. Add Italian Herb Marinade. Let chicken marinate in refrigerator for 1 hour. Remove chicken from plastic bag and discard marinade. 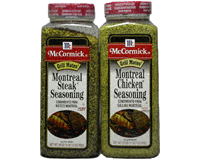 Montreal Chicken® is a registered trademark of McCormick and Co.